BNC offers its clients a complete range of services - from strategy consulting and preliminary studies through to planning, implementation, operations and marketing in the fields of telecommunications and information technology. BNC also offers clients services in logistics and logistical support in Iraq and Afghanistan. We react quickly, getting the job done when you need it, without a lot of "red tape." We develop innovative and effective solutions designed to meet your organization's specific business needs and opportunities. We stand behind everything we do, delivering solutions designed to work both now and well into the future. We specialize in intimately understanding global business environments, industry trends, technological change, and the needs of the end customer. We have a proven track record in providing effective solutions for governments and corporations worldwide. Broadband and Networking Consultants, Inc. established in 1995 is a telecommunications, IT and Logistics Support firm, specializing in providing products and services to our clients in the USA and Internationally. 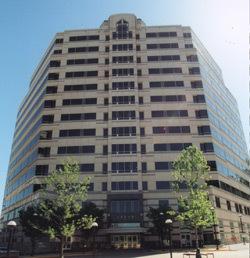 Here is a picture of our office building.